Iraqi Catholic refugees, along with their exiled countrymen, are voting in the first parliamentary polls since the 2011 withdrawal of U.S. troops from their violence-plagued nation. Iraqi expatriates in more than 20 countries were permitted to cast ballots before the April 30 vote in Iraq. Newcomers, such as Um Martin, told Catholic News Service that the security situation for Christians in Iraq is becoming ever more precarious. They hope the vote will remove Prime Minister Nouri al-Maliki and put in someone more capable of addressing the surging violence and instability. “If there is change following the elections, we will return home. But if not, then we will remain in Jordan. Honestly, al-Maliki did not accomplish anything. Things are bad,” he said with frustration evident in his voice. Al-Maliki is battling for a third term as prime minister, but he faces opposition from political opponents. The resurgence of sectarian violence, which nearly tore Iraq apart in 2006 and 2007, underscores the precarious politics of a democratic, but splintered nation. Father Moussalli’s Amman congregation currently has about 2,000 people who have come from all over Iraq, including the capital, Baghdad, the northern areas of Mosul, Ninevah, and Kurdistan as well as the predominantly Shiite city of Basra in the South. “We hope that the new government will make peace,” he said solemnly. A Catholic from Baghdad, Abu Laith, said he and his family fled to Jordan a year ago because many family members were killed. Despite having a good job as a nurse in a hospital for 12 years and having his young children enrolled in school, he and his family decided to leave Baghdad because of the violence committed against his family and their Christian community. “The terrorism must end. The people of Iraq are not OK,” he said as he came out of the polling station holding his 10-month-old son. Whether Christian, Sunni Muslim, or Iraqis from a tiny sect called the Sabean-Mandean, who are followers of John the Baptist, those interviewed at the polling station said they want to see al-Maliki out of office and someone else at the helm. 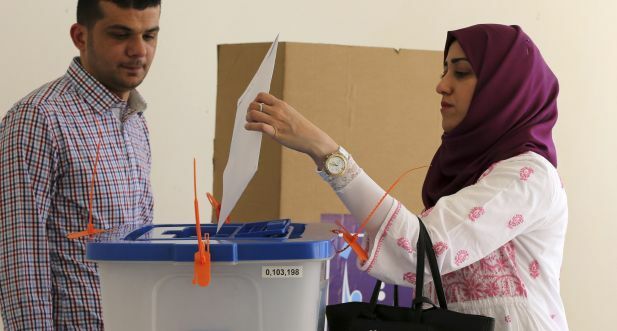 But some analysts believe voters in the April 30 polls inside Iraq will cast ballots along sectarian and ethnic lines, with no single party expected to win a majority. With more than 9,000 candidates competing for 328 parliamentary seats, others said they expect an alliance again led by al-Maliki, a Shiite, to win and for him to seek a third term as prime minister.